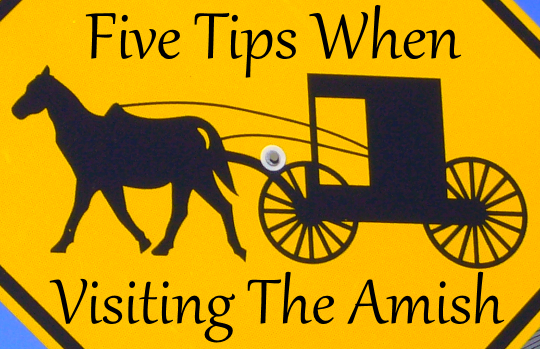 Are you planning to visit an Amish community? What are some things to keep in mind when you go? In today’s post we look at five tips that you might find helpful. I realize people are in different situations–some of us have visited Amish communities many times, while others have not but may be planning to. 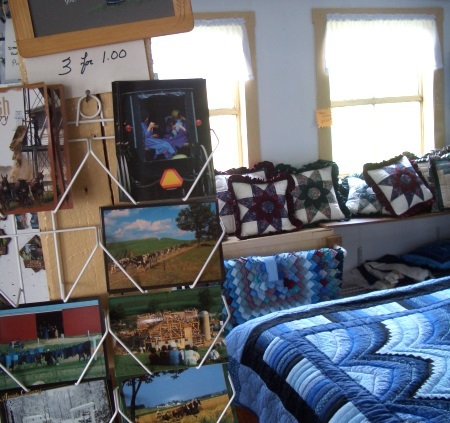 This post assumes you are visiting as an outsider without a lot of connections or contacts among the Amish. Thanks to reader Trish for today’s post idea, and for suggesting some of these tips. There are a number of things to do when you visit an Amish community–especially in those areas which have a developed tourist industry. You can certainly have a good “Amish-style” meal, and you might even have an Amish person waiting on your table. A buggy ride with an Amish guide or a visit to a cultural center can be a good way to learn about the community and the Amish in general. But many visitors would like to interact with Amish people “on their own turf.” Luckily, there is a great way to do this–by visiting an Amish business. These are usually located at Amish homes and farms or in the form of roadside stands. Most welcome outside visitors (I’ve only really felt out of place once or twice in an Amish store). Amish communities usually have at least a handful of shops and often many more than that. Not everyone is going to take five minutes to talk, but some store proprietors enjoy interacting with customers (particularly those in the more public-friendly trades, or those who don’t have other customers waiting to tend to). It’s not a bad idea to buy something while you’re there, which you’ll probably want to do anyway. There are also some Amish who do home meals for groups, especially in the larger communities. You may have to ask around to find these as they don’t always advertise. Going hand in hand with the above, you don’t have to act in a stilted or stiff manner around an Amish person. The first time I really met an Amish person I think I was a bit awkward, and I probably said something dumb. This was a housewife in Arthur, Illinois, when I was doing my job selling books. I found I didn’t know how to “relate” to this person who admittedly seemed exotic to me at the time in her plain clothes and with her small children chattering in some strange tongue which I later learned was Pennsylvania Dutch. I think some people visit Amish with the idea that they have to watch every thing they say or not discuss technology for fear of offending someone. I know I’m generalizing here, but it’s actually harder to offend Amish people than you might think. People have senses of humor and personalities in every culture. This doesn’t mean don’t be respectful, but just to treat people like people and realize that Amish people may know more about your culture than you might think. Not always the case, but either way it’s a good idea to relax and be yourself. That said, you actually might want to keep one thing in mind: the clothes you wear. No, don’t go out and buy broadfall trousers or prayer coverings and try to mimic how the Amish dress–that would be weird. But even though you may be visiting in the heat of summer, it can be a good idea to dress a little more formally than you otherwise would (read: show less skin). Typical English clothing is by nature more revealing than what the Amish are used to wearing and seeing in their communities. 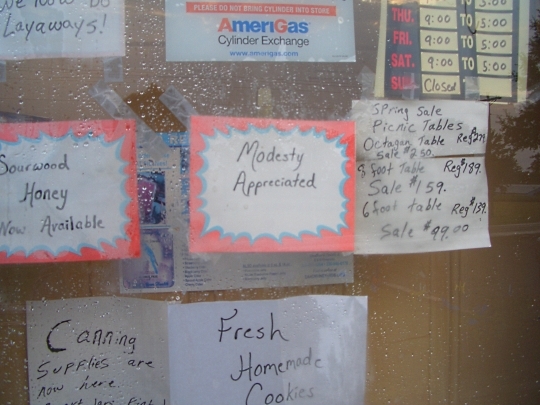 And what might not seem immodest to us may appear that way to an Amish person. To be frank, Amish people in the larger communities (and not only) are used to non-Amish people wearing revealing clothing, particularly in the summer. No one will say anything to you, but it will be appreciated, and you won’t feel as self-conscious if you cover up a bit. You probably know that Amish don’t do business or work on Sundays. But it’s also worth mentioning that in some places non-Amish-owned businesses may close as well. For example, Berlin, Ohio basically shuts down on Sunday (or at least it did last time I visited on that day; I think the coffee shop may be open 🙂 ). But it’s a ghost town compared to a day earlier, when in tourist season especially, traffic can be bumper-to-bumper. Obviously, chain stores and McDonald’s and such will be open, but it’s generally not a great day to do a lot of shopping even if you are planning on visiting a non-Amish store. On Sunday you will see more and different activity, especially in larger communities. This means more buggies (and foot traffic) on the road as people travel to and from church, go visiting, and as youth head to their singing groups, on dates and other activities. We have touched on road safety often here, but it bears revisiting. You might be surprised at first how quickly a vehicle going 45 mph comes up on one doing 8. Driving in an Amish community means taking down your speed a notch and turning up your alertness. In some communities, like Holmes County or Lancaster County, hills and curving roads can conceal horse-drawn traffic until it’s too late. Accidents have also been caused by factors out of our control, like the sun blinding a driver or horse issues. Another thing to be mindful of: other automobiles. 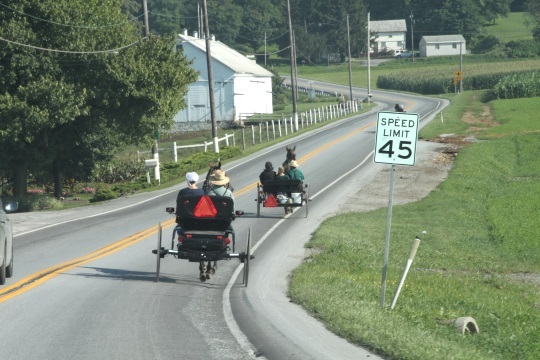 Some drivers are not very careful about when and how they pass Amish buggies. Don’t pass on blind curves or when a hill lurks ahead. Unfortunately, you may see people do this. You may have to wait for what feels like a long time before you can safely pass. The buggy driver may try to accommodate you by veering over to the side, but don’t take this as necessarily a sign that there is enough room and visibility to proceed. And when you do pass, try not to cut the buggy off, but leave a wide berth if you can when returning to your lane. Finally, it’s not just the buggies to be mindful of. In particular, you have to watch out for pedestrians–including children. Accidents happen with children walking on the road to and from school, or on or near the road for other reasons (sometimes driving a pony cart). Some are wearing safety clothing but if you’re not alert to it a bright orange vest can only do so much good. That’s not to end on a negative note, just something to keep in mind. I hope these five tips were helpful. 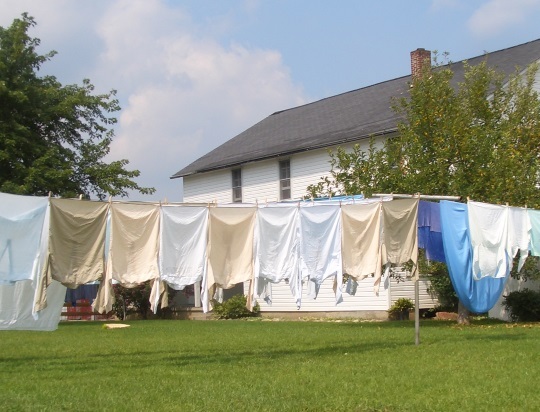 Of course they aren’t the only good ideas when visiting an Amish settlement. What other tips would you add to this list? Images: buggy sign- shaun_and_jacki/flickr; buggies on road- Ed C.
I have photographers visit my gallery and then send me or send me links to the pictures they take in this part of the world. Here Amish do not want their faces in pictures. I tell photographers this. It apparently “goes in one ear and out the other”, because so many do not respect these wishes. As a matter of fact, if you take a picture of an “English person” and then publish that picture you have liability unless you have a signed release form from that person (or that person’s guardian). So as a photographer, if you know this and respect this why treat an Amish person any differently. I would think that if they don’t want their images captured that we should do our best to respect those wishes. Something for your readers to ponder when they start taking pictures here in Northern Indiana. Hey Erik and Everyone. Good to be back after a vacation and some extended visiting with family. Thanks for the insightful post — sure wish I’d had this five years ago when I first started visiting the Amish. But I was fortunate in that most of my first visits were those areas that were more tourist-friendly — and they knew about folks like me even if I didn’t know about folks like them. I thought I’d add a couple thoughts to your post, since you asked. Being the Amish-related photographer that I am, I was going to mention something about Amish and photography — but David beat me to the draw. In short, every Amish community is different — some don’t want to be photographed at all, some don’t want their faces pictured, and some just don’t care (although they are not likely to pose for you.) So if you choose to photograph (as I do at times), it is wise to follow the advice one older Amish man told me a couple of years ago: Don’t gawk, and don’t get up in a person’s personal space. Be as inconspicuous as you can. But being inconspicuous is not limited to just taking pictures of Amish people — it applies to other pictures as well. In some places like the inside of an Amish store, I’d leave the big SLR in the car and take in my point-and-shoot (w/ flash turned off). Speaking of stores, Erik, for the new-to-Amish folks it might be worthy to mention that some Amish stores may have what seems to us to be very weird hours. Some of only open part time, others are closed on odd days of the week (e.g., Tuesdays). And in some of the lesser-touristy communities, you may find an Amish store that caters more to the Amish community around them than to English folks, which (in my experience) is when there might be a greater sense of awkwardness in trying to interact with the store owner. Good additions Don, thanks, and welcome back. 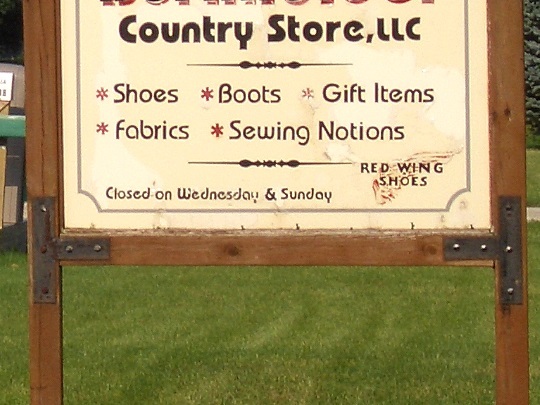 Glad you brought up the store hours, it is true that some can have another closed day in the week…the photo I posted above (it is of Borkholder Country Store in Nappanee, IN) shows you that they also close Wednesday. A few more tips here : Treat us like people, because that’s what we are ! You would be surprised how many people come here and treat us either like zoo animals and gawk and stare.Nor like we are Celebrities. We’re neither, so just be yourself. Be friendly and courteous, but not to the point of being fake. We can tell if you’re genuine or not. Also and this is mostly for the men- Don’t be overly friendly or flirty toward the young ladies. We do not appreciate being called honey and sweety or winked at by the men. And don’t be surprised if we don’t remember you the next time you visit our shop. There’s millions of tourists coming through each year, so unless we have a specific reason to remember you we probably won’t.Also don’t expect special treatment, because you came all the way from Texas, New York, or California to see us, because join the crowd (You’re one of millions). People come from China, Europe, India,etc. also. Or because you have such a great interest or appreciation for Amish. Many people do. We’ll try to be friendly toward all. Go ahead and ask questions, but don’t make assumptions and accept it if you’re proved wrong. It might be a good idea to do some research before you go to a certain community, but don’t believe all you see on the internet and especially not TV shows or the Amish fiction novels. Above all keep an open mind, Amish are all different, even within the same community. Looking forward to having you here ! Rebecca, thanks for your polite comments. You hit it correctly. people sometimes don’t take the time and research the Amish or any other item they are going to visit. A lot do but there are some that don’t. I don’t think it is all intentional but regardless they are violating your space. Before we moved to Georgia, Lancaster, PA. was our second home when we lived in upstate NY. We loved the country living, the friendly attitude of the people and for me the Amish life style. I know for a lot of the English they may think that a lot of the Amish folks they see are probably actors. I myself have the utmost respect for the Amish and their life style. I may not be able to adapt to it these day but when I was younger and not exposed to the modern things we have in life I think I would have loved to live that way. My wife says she could without a doubt. Thanks for sharing your thoughts. Hopefully this will help some of those that are not completely knowledgable of the Amish culture..
Nice add-ons Rebecca–right to the point. I was a little surprised to hear about the behavior towards women–then again I am not one, nor am I Amish, (and sweetie and honey not really in my vocabulary) so I’m not plugged into that experience. Must be tiresome. And I can see in your suggestions some of the expectations you encounter from people. Regarding “special treatment” or being remembered, I can see how some might think that way–not realizing how many people pass through the area as visitors each week, month, year. I know that people are polite in your area regardless. Not to sound unkind here, but it generally seems older gentlemen who have this tendency. I believe (well hope anyway) that they don’t really realize how it makes us feel. It makes a young lady self-conscious and therefore will soon seem less friendly. We have also been taught to be careful around strangers, especially men. There’s too many crazy things happening in this world to not be careful. Two simple things–perhaps already hinted at, but worth making very clear. First, SMILE a lot–not stupidly and phoney, just happy and open. I’ve had a number of Amish folk actually start conversations with me–I’d like to think it’s because I appear (and am!) approachable. Being from small-town rural Maine this is actually almost instinctive–we get used to the idea that everybody is a neighbor and exchange pleasantries very commonly and naturally. Second, show respect and awareness–this ought also to be very natural and common, but our fast-paced and often self-centered world means we aren’t always “in tune” with those around us. I think my favorite “Amish Conversation” was with a toddler… I was strolling along the road past her farm and she came running down from the barn to greet me. I didn’t understand a word she said (well, not literally) but her arms were waving and gesturing and her smile and laughter was infectious. So I spoke back in a language she didn’t understand either, also gesturing and smiling. It was a wonderful reminder that communication is about much more than words. I like that idea about going to benefit auctions. We have some here in Holmes about every weekend in the summer. The Firemen’s fundraisers and other such events would be good ones, too. Or spend the day at the local livestock auction. Best place to meet farmers and others who just like to go to hang out. Events like Charm Days, New Bedford Merchant Days, Mt.Eaton Days and others like that. You get to mix and mingle with locals, Amish and non-Amish alike. Just don’t appear too touristy (taking pictures, gawking). Just be there, be alert, mix and mingle, strike up a conversation or 2.Most people are friendly. Plus if you’re at any such event, the money from the food and many other things will benefit a needy family or other charity. I’d probably suggestion not dropping the ‘F bomb’ in an Amish business, or in areas where Amish congregate. Although people do swear, especially young English people, I’m sure the Amish don’t want their children learning any inappropriate English words while you’re there (although I guess they will hit from the neighboring locals). But I suppose that goes without saying. Some people, because of modern music, popular culture, and upbringing are desensitized to the potty mouth language they use. Good Point, SHOM, It is offensive to hear bathroom words in every sentence, that’s not saying you won’t hear any such words from Amish, but most of us refrain from using them and have been taught to use clean language. This again will vary from family to family. Let your yeah be yeah and your nay be nay. Rebecca, your post brings a question I’ve had to mind. On a few occasions I’ve heard some Amish use “bathroom words” as you call it. One instance in particular it came from a kindly gentleman who I’d guess was in his 60’s, who used the term “chicken sh**” to describe what is clean out of chicken houses. I took no offense, but it surprised me that this respected man would use the term. It got me to wondering — and maybe you can speak to this — with PA dutch as the ‘mother tongue’, are there times when an Amish person might use an English word that is correct by its dictionary meaning, but may not be so polite based upon its popular meaning? Yeah, I would say it would be more common for an Amish man to use the s word when he’s actually talking about the stuff. We are perhaps not as polite or politically correct in our speaking and say things more as they are, so I’m sure we are probably sometimes offensive to others in that respect. In PA German he would likely have used “misht”. But the majority of us would try not to use such words at all and especially not in public. That’s what I was figuring. Thanks. i am toying with visiting a Mennonite Church in my area that I was surprised to find out about. I know nothing about them. Do you think I ought to email the group and express my interest in taking in a service? In all likelihood the people that attend are very progressive in their ways, but still need to be given respect by me as a guest, right? Mennonite churches can vary greatly from one to another. Old order will be very much like the Amish. The other end of the spectrum would be the Mennonite Church USA. They are considered mainstream and liberal when compared to other Mennonite churches. Emailing ahead of time would be a good idea. Just let them know you’ve never been, are interested in attending a service, and would like to know what to expect. My husband and I just got back from Florida. We visited the nearly deserted Pinecraft and loved the serenity offered this time of year. We visited Der Dutchman and were waited on by a young Amish woman. I actually got a lot of curious stares just because I was wearing a modest jumper. I didn’t have my hair covered and it’s quite short, so I found that odd. The food was quite good, especially the bread pudding, which I don’t normally like. I was disappointed that the ice cream that comes with the buffet was just what you’d find at any other buffet place. We went to Pinecraft park on another day and were surprised and delighted to see toddler play equipment at the playground. I’ve never seen any before. We didn’t have our daughter with us, but if we move to Sarasota, she can try it out then. I hadn’t realized that there is a nice, wild rainforest area by the parking lot and it was a lovely surprise. There was an older, Amish man riding in a golf cart, doing some landscaping maintenance. Over by Yoder’s, we saw a different man, also in a golf cart who pulled up in front of one of the cottages and said hello as we passed. A young mother and her little ones came out of another house in front of Yoder’s parking lot. The whole neighborhood was quite different than I’d imagined. The roads were narrow and houses close together. I experienced a wonderful peace after the busy, unfamiliar Sarasota. We ate at Yoder’s and were waited on by a formerly Amish woman who was very open and friendly. She was one of eleven children and was preparing for a move back to Indiana to help care for her mother. Her manner was different than anything I’d ever encountered. I felt welcome and cared about from the very start. It was my best dining experience. Oh, I should add that this time of year, we had no wait. We were seated immediately. The chicken fried steak and potato cakes were excellent. The pie was as good as I remembered the Yoder’s restaurant in Kansas being. We wished our server a move blessed by the Lord after she stopped to wish us well and God’s blessings with our move to Florida. I hope to get back there before she moves. I tried very hard to act normally, but honestly, I was so excited. In our culture, I don’t fit. Of course, I don’t fit in the Amish culture, either. But I know that when I’m among the Amish, I know I won’t offend people when I talk about God. I know I’m unlikely to hear crass language or be bombarded with immodest clothing. We share many of the same values. But I’ve had very little interaction with the Amish, so I find myself to be nervous. I’m an introvert and quite shy. If I’m out of familiar territory and someone outwardly friendly doesn’t help me feel at ease, I probably will seem very reserved and “stuck up.” So just something to think about if you see someone acting like me. I’m not trying to be rude. I’m just not at ease and don’t want to appear to be a crazy tourist. We went to the gift shop next door to Yoder’s. They had many Amish-themed items, including outfits for kids, but I didn’t expect to see many of the usual touristy things. Only a small section was actually Amish-themed. I’m excited to return to Pinecraft. I should add that I gained 8 pounds on vacation even though I had fruit for breakfast and salad for dinner every day. I think it was the pie. Thanks Amy, nice “review” of Pinecraft, and of course food tips are always welcome here 🙂 I’ll never forget the key lime, coconut, and chocolate/peanut butter pies I got at Yoder’s. Yum. Question: Do the Amish train English apprentices in the trades they still do but that have been bypassed by technology in most other communities? Ie blacksmithing wheelwrighting cooperage wagon/buggy making? Shaphan sometimes English work in Amish businesses, more often construction or woodworking. I haven’t seen a lot of English in the buggy/wagon/wheel/etc. industries. But if you establish a relationship with an Amish person and want to learn, you might be able to. I’m an elementary education major in Iowa and have the privilege to visit a one-room Amish school for a whole week! I believe I will mostly be observing, maybe a little bit of large group instruction, but it’ll be very different than what I’m used to. I’m a little nervous, but mostly excited for such a unique experience. This article was very helpful/insightfull, I’d love any other advice!